Did I say "NOT possible"? I wanted to give it a try anyway. Some years ago I started a Python project called DXconvert. The original goal was to be able to convert between the many different file formats that people have used and use to save Yamaha DX7 System Exclusive voicedata. Not much time later I started developing TXconvert to support 4-operator FM synths. Over time this project has grown to support hundreds of fileformats and a whole family of vintage FM synths. When the Yamaha Reface DX arrived I immediately hoped to be able to (re-)use my huge library of SysEx patches for 4-operator FM synths that I had collected since I bought my first Yamaha synth somewhere in the late 1980's. But because of the major differences I had to put a lot of time and effort in expanding the conversion power of my TXconvert software. This website is the result of these efforts. I have (tried to) re-create the original patches from several vintage Yamaha (and Korg!) 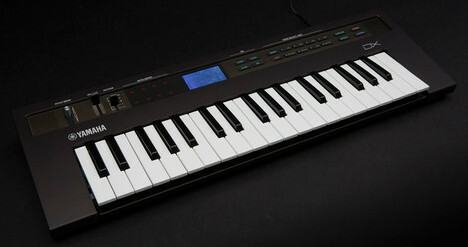 FM synths to System Exclusive files that can be loaded in the Yamaha Reface DX. How to load the patches in my Reface DX ? I am getting a lot of questions about this. It seems working with SysEx dumps and files is less common in these days than it was in the old days. For example Yamaha's Soundmondo website doesn't work with SysEx files that you can save/load to/from your local harddisk but is based on cloudstorage. And the soundmondo App for iOS devices uses QR code images that you can scan to send the data to your Reface DX. To handle SysEx files (*.syx) you use a universal SysEx dump utility. Universal meaning you can use it for any MIDI device that can send/receive SysEx data, not just the Reface. If you need an offline editor/librarian for your Reface DX you can download the Reface DX Editor Panel that I created for Ctrlr. I have collected some links to SysEx Dump Utilities for several platforms.